Grilled pizza was created more than 30 years ago by George Germon and Johanne Killeen at their restaurant Al Forno in Providence, Rhode Island. Flame-seared pies now turn up at innovative restaurants across North America—and around the world. So why is pizza even more irresistible when cooked on the grill? A grill, whether charcoal, wood-fired, or gas, comes the closest that most home cooks can get to achieving the high temperatures (700 to 1000 degrees) routinely used by commercial pizzerias. The crust is not only more flavorful, but is bumpy with blisters and tasty with crispy bits of char that cannot be obtained in a home oven. Grilled pizzas take only minutes to cook from start to finish (although you do need to allow time to make the dough and toppings). A pizza stone is optional; you don’t need one for great results. Grilled pizzas are easy to customize for a crowd at a party once you’ve organized an array of toppings ahead of time. In short, grilled pizza is easy to make, impressive to serve, and arguably one of the best things you’ll ever put in your mouth. Enough said. When making grilled pizza, aim for a thin crust and restrained application of toppings. You want to taste the smoke and fire in the dough. The dough will be quite elastic, and may resist your first attempts at stretching. Simply let it rest for a few minutes, and eventually, you’ll achieve the proper shape and thinness. Don’t worry about making a perfect circle. I actually prefer a rough rectangular shape for grilled pizza. To simulate the smoke flavor of a wood-burning oven, toss a handful of unsoaked wood chips on the coals. Why unsoaked chips? Because you want a light smoke flavor, not the heavy smoke of barbecued meats. If you are grilling on the grate without a pizza stone, build the pizza in the exact opposite sequence as a conventional baked pizza. The cheese goes on first because it takes the longest to melt. Then the cooked or cured meats and grilled vegetables. Last of all, the sauce (because it’s already cooked). 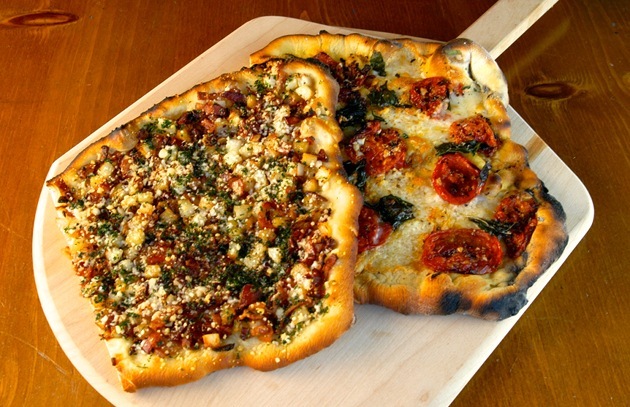 If you are using a pizza stone to “grill-bake” the pizza, assemble it in the conventional manner: sauce first, then meats and vegetables, and finally, cheese. To find out more about the two basic approaches to grilled pizza (true grilling vs. “grill-baking”), click here. What are your secrets for grilling the ultimate pizza? Do you have some favorite toppings that are totally over the top? Share your recipes and photos with us on the Barbecue Board or Facebook.